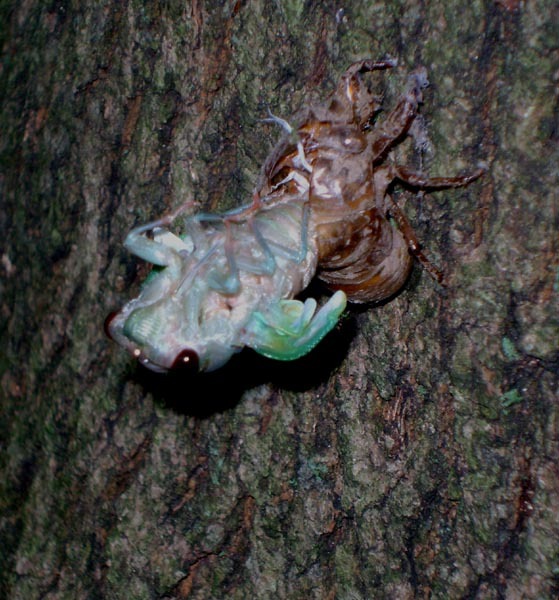 Cicadas sure are weird looking! Strange to think that this little thing has been hanging round in its nymphal stage for a couple of years before hatching out of its shell to annoy me with its constant droning through the hot and humid days of August. Pretty cool to see the thing popping out of its shell though. Anyway I found this rather cool time series animated gif on Wiki of one bursting out of it’s shell (here). Anyone have any idea which species it is? I am assuming it’s one of the Tibicens? In Japan, it wouldn’t be considered summer without the sounds of 蝉 (cicadas). Noone here would consider their chirping “annoying”! >Anyone have any idea which species it is? Looks like 「アブラゼミ」 (Japanese Cicada). BTW, did you take that photo? Not many people catch one shedding their shell.